I have a TV service with over 500 options which includes dozens of movie channels that run nothing but for twenty-four hours a day. You think with the money I pay for this service and the abundance of offerings there would be more of a selection every evening that would keep me happy, especially during the month of October. For some reason whoever schedules these stations thinks they are the only ones who came up with the ingenious idea of running nothing but horror movies for the whole month of October. Vampires, zombies, and angry boogie men vie with alien creatures and serial killers over tasty human beings. The “family” channels feature psycho-thrillers with demented men, women, and children who consider family and the unsuspecting traveler as easy prey and plan their gory deaths. Even the kid-friendly channels bury us with cartoon versions of the same. Call me a scaredy cat, but I just cannot watch scary movies. I cannot stomach anything that literally eats away at my imagination and makes me believe that what is happening is real. That does not mean I cannot defend myself. I can be Ripley or Clarice. I can be Selene (though I doubt I would look good in skin tight leather, at least not without some serious undergarments). I have learned certain skills in life. My upbringing has given me the innate experience necessary to make up for the loss of agility that I have never possessed. I can swing a mean frying pan and shoot a gun. I am an expert at the fly swatter, the rolled up newspaper, and the shoe. Many a varmint could attest to my expertise except they can’t since they met their demise at my masterful hands. It’s when they show up in 3-D on my wide screen that I cannot handle things that come at me from outer space. I cannot find my inner Ninja when things sprout up from the ground and their first thought is to snack on me. Any alien queen who captures me and tries to cocoon my aging body to breed little aliens is out of luck. My breeding days are over. I hate horror movies and now we have TV shows based on all this boogie stuff. Though I love a good story, I am drawn to fiction with strong, likeable characters. How does a writer accomplish this? There are hundreds of books on characterization, and I have studied quite a few excellent ones, but I have discovered an answer in the most unlikely place – the science of cognitive psychology. I use a simple heuristic that was developed in 1955 to explain how a person presents himself and interacts with others. It is called the Johari window. Each quadrant is called a window and it studies the human being from four different perspectives. How persons represent themselves to others is called the Open Window. It is how they dress, act, and react. This is how they want to be perceived. It sometimes differs from how others see them. 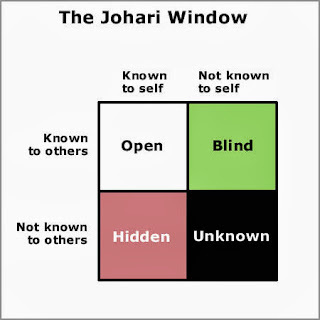 In the Blind Window, the person is unaware that others might judge them differently than how they presented themselves. In the Hidden Window, they keep things to themselves they do not want others to know or that only very few might know but are not allowed to share with others. Sometimes they might not even acknowledge some of these inner conflicts to themselves. The fourth window, the Unknown, lies the unforeseen future. It might happen in the immediate future or it might lie far ahead, but everyone eventually encounters a test or a crossroad, and they will have to respond employing the traits displayed in any or all the other windows. I owe my gratitude and my apologies to Drs. Joseph Luft and Harrington Ingham since I took their heuristic and adapted it for my own use - to create fictional characters. I start with the Hidden Self quadrant because this square houses the inner conflict and drives all the others. I explore the character's secrets, fears, - anything that the character keeps hidden from others. This is the vulnerable side of the character and drives all the other squares. It contains the story. The “hidden self” will influence how the character dresses, how they act, how they react to others. Like a mannequin in a store window or an actor in a movie, I dress the character and place them in the Open Window. I look for some qualities that might be easily misinterpreted or misconceived and will fit in both the Open and in the Blind Window. For example, a person who has a traumatic past (hidden self) will dress and act a certain way either to deflect attention or put on a false bravado (open self), but others might misinterpret the character as cold or distant (blind self) since they do not know the person’s hidden past. By filling in the Johari, the character becomes rounded and solid – a realistic person who stands out from the others and draws attention from the reader. He/she is now ready to face the Unknown. The Unknown quadrant houses the outer conflict, the quest, the challenge. The character will respond based on the traits the author developed in the other three quadrants, but especially those in the Hidden Self where the inner conflict and the character's story lie. This conflict will test the character’s resolve, and it is how he/she responds that the author has created a satisfactory story with realistic characters and a believable resolution. When I graduated from college in 1971, my dream was to teach for a year, maybe a year and half, in a local high school and save my money, then I would go get my doctorate in Spanish and teach in a college. I would travel during the summers to all the Spanish-speaking countries of the world and become world famous for my studies. I had a teaching assistant job offer good for two years at UT Austin and the promise of a Ford Fellowship. Everything was set in place. I just had to get through the next eighteen months. My mid-year teaching assignment was in a high school in the deep south side of the city. I was to teach junior and senior Spanish and English. Since the neighborhood was mostly Latino, so were the students. No problem, I thought. I was from that neighborhood. I was Latina. It would be a piece of cake. These were kids about to graduate, so they didn’t give me much trouble. My biggest problem was my age. I was twenty-one and my students were ages 16-21, so I looked too young to be their teacher. My second biggest problem was that everything was fine as long as I didn’t expect the kids to do any work. If I read to them, they listened and answered questions, but if I asked them to read on their own very few followed through. When I called on kids to read for me, the same handful of students would volunteer, but if I called on others, they refused and the same handful of volunteers would intervene and read to the class. I became suspicious and one day announced that each student would be required to read one paragraph out loud for me as a test grade. I started up one row calling on students. Some refused belligerently and others got violent. Nothing I said calmed them down so I required them to see me privately, before or after school. It did not take me long to discover what was wrong. Most of the kids were illiterate. Handfuls were reading on a pre-primer or primer level. I was shocked. I had gone to a neighboring high school. I had always been in advanced classes so my circle of friends were “the smart kids.” I never realized how lacking the school system was back then for the kids who had learning disabilities. Those who made it to the eleventh and twelfth grade had been passed on or had dropped out. I was saddened by the fact that there were hundreds if not thousands who would “graduate” from high school but would not be able to read more than their name. I kept on saving my money for graduate school but in the meantime I studied all I could on my own about teaching older students to read. The deadline to take advantage of my UT teaching assistantship and my fellowship came and went, and I continued to teach in the same old school district. I transferred to a nearby junior high and took a job teaching remedial students. Maybe if someone started with students who were a bit younger, they would not end up holding a useless diploma. I got my graduate degree in reading. I got a job as the reading coordinator for that same school district, and for five years I helped develop a reading program with twenty-two top-notch reading specialists who served four middle schools and two high schools. They did awesome work. I transferred to another school district after that, but by then remedial reading programs in secondary schools were sprouting all over the nation. It pleased me to see more and more accountability towards high school graduates. I never got my doctorate degree in Spanish language and literature. I never traveled to the many Spanish-speaking countries of the world. I never became a world-famous college professor, but there is a large group of adults who are able to read because I traded one dream for another. Character questionnaires ask inane questions - a character’s favorite color or what they have in their refrigerator. These questionnaires are superficial and cosmetic and do not create characters that walk off the page and into reader’s hearts. Readers want to connect with the character’s inner workings. They want to empathize with the protagonist’s feelings. What is their inner conflict? What are their fears? What secrets does the main character keep so hidden that even they do not acknowledge their shameful existence? In order to face whatever conflict the author throws at them in the story, they must be armed with more than their favorite color or the contents of their refrigerator. It is only when the author builds characters from the inside out that he can costume them with the kind of frippery found in questionnaires. It is only then that the inanity of the questionnaire becomes integral to the story. For example, a female protagonist neglected as a child by her alcoholic parents and who had to fend for herself and them would probably be ashamed and hate her childhood. She would overcompensate for her childhood helplessness by being in charge and in control of everything in her adult life. She might yearn for love and attention, yet keeps everyone at arm’s length. Her favorite color would be red since it stands for power and pain and passion. She would keep a six pack of beer in her refrigerator which she never drinks. It is there as a hated symbol of what destroyed her life, but it is also a fearful reminder that she too has a hereditary propensity for alcohol addiction. Remember, nothing should be merely superficial, coincidental, or cosmetic. Everything is dependent on the character’s hidden side, the inner workings, the psyche. To create strong fictional characters, the author must intentionally give them strong personality traits, either good or bad, and thereby make them realistic and believable.